Discussion in 'The Refreshment Lounge' started by Blake Bowden, Mar 25, 2010.
yea... saw that. phenomenal. amazing. incredible. What is the difference between this and the HD2 that came out yesturday, and that I will be purchasing in the next week? 4G. it's as fast as wifi. and the hardware is around 3x as robust. this phone is essentially a netbook. See I read something that Sprint's "4G" in not truely a 4G network but a slightly enhanced 3G. That we are still many years away from a 4G network. I just pulled up the Tech Specs and they have the same processor and all. Boils down to Windows 6.5 with HTC Sense (Which is getting awesome reviews because of the Sense add ons) and the Google Andriod system. To me personally either way you go these could be the iPhone killer we have all been looking for. Word is though that Apple is about to come out with another version of the iPhone later this year. Personally I am not waiting. I have been waiting on the HD2 for many months now and it just so happens my carrier has it. Time to buy if you ask me. and that was sept 2009. wimax has the potential to go much faster. That's all propaganda. We both know that Wimax causes cancer and kills babies. I'LL NOT STAND FOR THIS. Just ordered 2 HTC HD2s from T-Mobile. My fiancÃ©e and I will each be getting one. They gave us 2 for the discounted price as a wedding gift since we will be getting married next month. Is that not the greatest? LIFE LONG T-MOBILE CUSTOMER HERE. Josh, with 4G you will be able to talk really really fast. LOL that is great.... T-Mobile only has the 3G network unlike sprint that has purchased network space from a company that owns the ONLY 4G network in America. However with a 1ghz processor and twice the ram and rom as an iPhone I will still be going pretty fast. Don't sweat it though. The HD2 is one of the best phones out there! The EVO uses Googles Android OS. I have to admit, unless Apple announces a mind blowing iPhone in June...the EVO will be mine. However with a 1ghz processor and twice the ram and rom as an iPhone I will still be going pretty fast. I absolutely love this phone. It is lightning fast and can do everything. Literally everything. I will have it programed to make a vote in lodge this evening. I personally am a fan of the windows based phone having the Blackberry then to a dash then to a Samsung then back to the dash until this. The FTC Sense is wonderful addition. I have witnessed a few freeze points but lock and unlock it fixes. Minor really minor issue. I will have it programed to make a vote in lodge this evening. i suppose the obligations never mentioned "owls' phone"
Can't wait till it arrives on Tuesday! Well I think you will likw it. HTC is my brand of choice and has been since the Dash 3G. I think they are on to something. I loved the o2 jam (right)! At the time, it was the smallest Pocket PC phone you could buy! 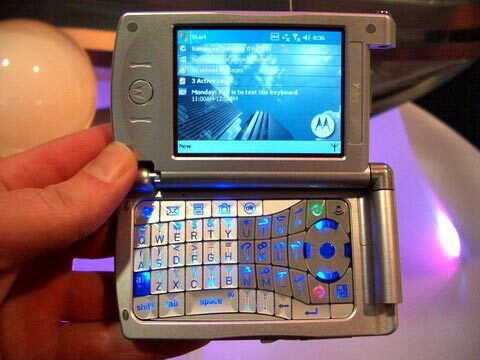 The coolest phone that I've acquired is the Motorola mpx 300. It was never released in the US, and I still own one of the enginerring samples. We basically have the same phone, just different operating systems. Wow the 1GHZ snapdragon processors and OLED screen are mind blowing! Called Verizon and had my number (from ATT) ported...lol. I'm sold. Yep. It is good stuff. I love my HTC and to think I have all the good stuff without having to sell my soul to Apple.